I want to practice a regular abhyanga routine of self massage. I’m going to start with once a week to see if I can get proficient at it. It seems to be a more time consuming regimen. My question is this…if i like to shower at night can I incorporate the self massage at night instead of in the morning? Also, if I am massaging the scalp it feels like I would need to wash it out before I start my day or go to bed. How do you do a daily massage routine and not end up washing your hair every time? Any suggestions for incorporating this ritual into a daily routine are appreciated. Abhyanga is an amazing practice to incorporate into your routine, either daily or weekly, especially during the cooler, windy vata season from October – January. Daily activity can be depleting (vata), so to nourish the tissues with unctuous warm oils can grounding, strengthening and healing. The practice of self massage with oils (or possibly powders) is known as abhyanga in ayurveda. Abhyanga can be part of your regular routine and it can also be a part of a cleanse or panchakarma treatment. It can be practiced with your quick morning shower or with your relaxing evening bath, especially since it is great for sleep. Abhyanga is a great daily practice if you have time, or at least try to slip one in on the weekend. It is always done before you hop in the shower/bath so that the excess oil that isn’t absorbed can be washed away instead of getting all over your clothing. 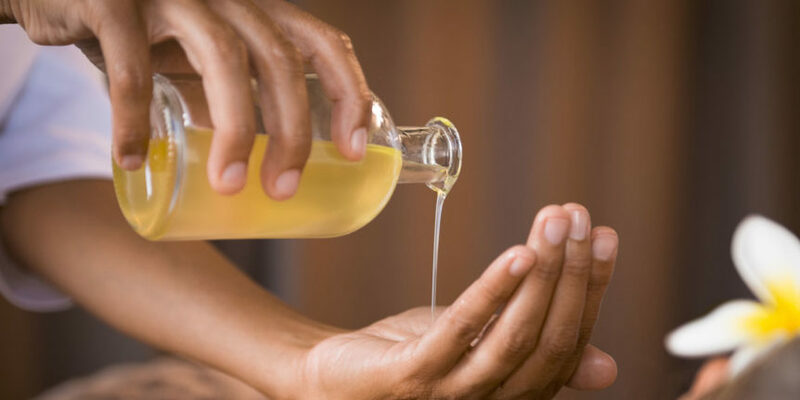 It’s ok to use oil after your shower or bath to keep skin moistened, but be sure you are completely dry before applying so that it’s not clogging. I like to use some almond oil post shower because Salt Lake City has such a dry climate which affects my skin. For vata (someone who is a little more depleted, dry, cold, mentally scattered, spacey) use a warmed sesame oil. If you feel you need a little extra, try ashwaganda bala oil. You can also mix the two oils if you’d like to use a lot of oil but keep your costs down. For pitta (someone who is always hot, sweating and thirsty) use room temperature coconut or sunflower oil. Neem oil is nice to have around, too, if you have been in the sun a lot or need something refreshing. You can add to specific locations or mix with your main oil. For kapha (someone who feels heavy, naturally a little stockier build) use just a bit of warmed sesame oil or a bit more sunflower oil, which is a lot lighter. If you feel you are fighting weight issues or congestion, instead of oil, try massing with calamus powder. Be sure to rub the oil or powder into your skin “against the hair”. Remember to always buy organic oils. Your skin will be absorbing them and they have to be digested by the body just like food. Sesame oil can be refined (less fragrance) or unrefined (traditional oil used), just don’t try toasted sesame oil or dogs will be following you around all day thinking you’re a stir fry snack. You may need a hot pot with two inches of water, or a kettle of water to heat the jar of oil. Be sure to remove the lid before heating. If I buy a large bottle of oil, I put it in smaller glass jars so that I’m not constantly reheating my oils. Sometimes I like to run the shower a bit while I’m applying the oil to get it nice and steamy. But don’t waste too much water. If you have a chair in your bathroom, you can sit down. Or just have a nice big towel on the floor. Typically we massage in the oil starting with the ankles and wrists, moving in towards the core. We do long strokes where we can, and circles on joints. Rub the oil in clockwise on the abdomen (clockwise if you are looking down at your own stomach). Very gently apply to the face, being very delicate with the eyes. It is ok to skip the head/hair if you do this daily because it takes a few shampoos to get the oil out. I would recommend doing your hair on a weekend or in the evening. You may want to get an oil with Bhringaraj in it for the hair. Vatas apply oil slowly and “with the hair”. Try to make oil application a soothing, relaxing practice. Kaphas apply oil or powder in a faster, stimulating fashion “against the hair”. Pittas that run light should apply like vatas, or that run heavier like kaphas, although not quite as stimulating. This practice should be done for a very minimum of five minutes (that’s totally doable, right?!) and each additional 1.5 minutes the oil will be nourishing a deeper tissue. We have seven tissues, so 15-20 minutes is ideal when you have the time. If you like to chant or listen to NPR to pass the time, sometimes that helps. As you may have figured, abhyanga can leave a mess in the bathroom. I have splotches of oil on the walls, the floors, and…the tub. This is where you have to get your pitta on and quickly wash the tub with a lot of dish soap after your shower. This will keep it from building up…and you’ll LOVE having a clean tub every time you shower! Plus you’ll never have to scour it with chemicals again because the dish soap will keep it super clean and help break up the oil in your plumbing. It seriously only takes a minute to wash it out since you’re doing it every time. Oils are very grounding, so adding oil to your forehead and soles of feet (wear socks after) before bed can help with sleep. Try Brahmi oil (vatas use sesame base, pittas use coconut base) for a very restful night. Kaphas, you most likely don’t need any help with this! Thanks LB for your question and for being interested in this awesome practice! You can definitely make it a regular practice with quick, five-minute applications and avoiding the hair. Doing it in the evening should help you find a sweet nurturing sleep, especially if you include drinking a warm mug of spiced milk and nutmeg with it! “with the hair” generally means away from the body, in the same direction that the hair grows in. Like how you pet your dog so the hair lies down against the skin. “against the hair” means you are going against the natural direction, meaning the hair will stand up. Do you have a question about ayurveda? Send me your question and I will post an answer shortly!